James A. Hodges passed from this life April 10, 2012. A native of Jenkins, Kentucky, he was always an inquisitive person who wanted to understand the world around him. He became interested in the ancient world, too. This led him to studies at David Lipscomb College (B.A. ), Harding College (M.A. ), and the University of Chicago where he earned a Ph.D. in the Department of New Testament and Early Christian Literature. Jim later earned an M.A. degree and the M.I.S. degree from the University of South Florida. At the University of Chicago in 1970 Jim completed a dissertation on The Building Program of Herod the Great. He taught in the Biblical Studies department at Florida College for a number of years. His last work at FC was as librarian. I can attest that his work in that position was extremely important in the accreditation of the Biblical Studies program to offer a B.A. degree in the field. In 1980 Florida College agreed to become a sponsor of the Excavations at Tell Lachish, Israel. We recognized that Lachish had been an important city in the history of ancient Israel. Four professors participated in the dig that year. Jim had already been involved in a dig in Israel, as had Harold Tabor. For Phil Roberts and I it was the first time to participate. Jim worked at several other sites over the years. In the photo below from 1980 Jim is in the middle position. 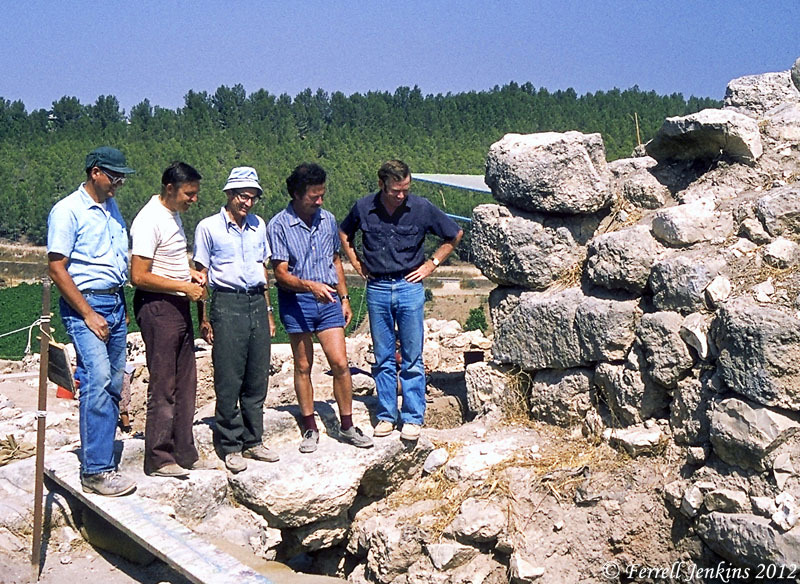 Professor David Ussishkin (second from right) talks about the excavation at the Gate of Lachish with Florida College professors Harold Tabor, Ferrell Jenkins, James Hodges, and Phil Roberts (left to right) in 1980. Jim worked in the Section that year. Here is a photo I made of him busy at work. 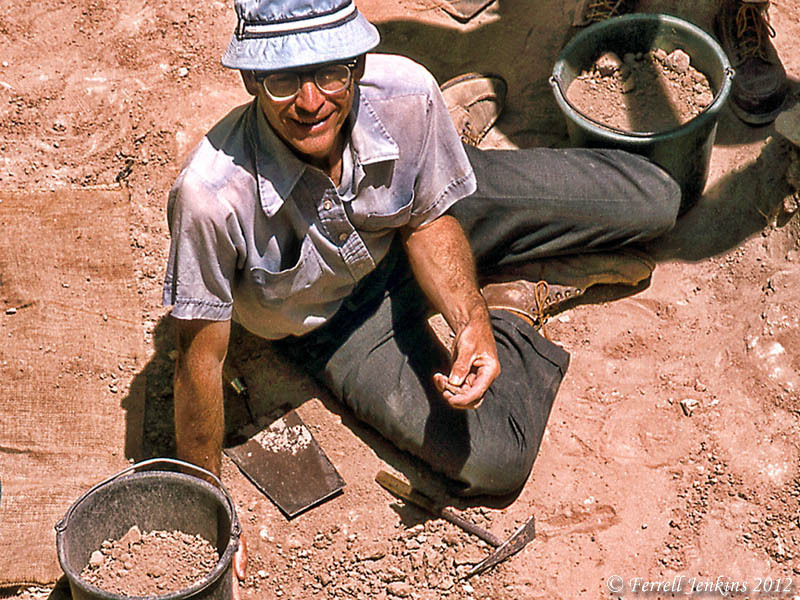 Dr. James A. Hodges in the Section at Lachish, 1980. Photo by Ferrell Jenkins. Hodges was a quiet and friendly man who sought to follow the example of Christ in his life. I think he was often underestimated by those who did not understand his vast knowledge in Bible, archaeology and Bible history, and the creation-evolution controversy. Several times I have remarked that he was my “go to” man. If I needed some reliable information to get by on until I had time to do a more thorough study, I often called on Jim. Jim’s hobbies were hiking and fossil collecting. He and Wanda enjoyed traveling throughout the U.S.A. and in various foreign countries. They were part of one of my Israel tours in 1993. Our condolences are extended to his wife Wanda (Diestelkamp), his children, and other family members. This entry was posted in Archaeology, Bible Places, Bible Study, Israel, Old Testament, Photography, Travel and tagged Florida College, Herod the Great. Bookmark the permalink. Thanks for this great tribute to Dr. Hodges. I never took one of his courses as a student, but I did have the privilege of working as a librarian with him for two years when he was the Director of the FC Library. The longer I was there, the more difficult it became to ever address him as just “Jim.” Easy to underestimate, yes — but also easy to be intimidated (for lack of a better word, even though he never would want that to be the case) as I grew more and more aware of just how many areas he could speak about with authority and knowledge. His diminutive frame and quiet nature masked a lithe intellect (able to classify and catalog works into their knowledge areas in seconds; minutes at most) and ability to physically out work me (and many others) on any given day. He was a model scholar and Christian. I wish I would have better taken advantage of the opportunities to learn from him and his convictions; what I did experience was a blessing I won’t forget. Thanks very much for this tribute to a good man and scholar. Dr. Hodges taught OT archaeology at Florida College in fall of ’71 when I was the only student who signed up for it. Then spring of ’72 I was one of two who took NT archaeology. I still remember the thrill of the first time of holding Herodian lamps, with his pointing out the black carbon residue as evidence that this provided light in someone’s home in the time of Christ. I appreciate his patience with me.